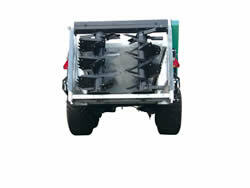 Power Push Manure Spreader | Takakita Co., Ltd.
Vertical beater with forward inclination! - Vertical beaters can be spread widely,fine grains,uniformiy. It is also used as a fertilizer to grassland. ※ PD14500,PD16000 series is ultra low floor wide long body. Durability and corrosion resistance body! - Both the side plates of the beater and the bars of the floor were galvanizinged and the corrosion resistance was further improved. The flooring boad is made of polyethylene. Auto stop system! - Automatic control of feeding speed by sensing compost pressure. Two-step pushing and double sliding floor! - Moving on the floor Smooth feeding of compost and less spillover from the side. Auto quick start ! - Speedy until fertilizer application starts. * Compost can be transported without being spilled. * Float going up is prevented by double acting oil pressure. * As for PD13000series , PD16000B, an oil pressure gate is equipped standardly. * The feeding speed of a slide floor can be adjusted ridden on a tractor. * Remote control attachment becomes standard equipment of PD13000 series. *PD13000SGB, PD13000WSGB, PD14500B, and PD16000B are disk brake specifications. *Spread width changes with kinds of compost.